Going online means connecting your iPod touch to the Internet using a Wi-Fi network. To surf the web, check e-mail, use the iTunes Store or App Store (or any other app that uses the Internet), or use Location Services on your iPod touch, you must first connect to the Internet. An iPod touch can join Wi-Fi networks at home, at work, or at Wi-Fi hotspots around the world. Although some public Wi-Fi networks are free, others require logging in first, and still others require logging in and supplying a credit card number. Still others are detected but locked — if you select a locked network, a dialog appears asking for a password. If you don’t have Wi-Fi at home, but you do have a broadband Internet connection (such as cable or DSL), consider buying an AirPort Express or AirPort Extreme; or if your computers include a Mac, check out Time Capsule, which combines the AirPort Extreme with a backup drive. You can then connect your Internet connection to the AirPort to extend Internet access over Wi-Fi throughout your home. 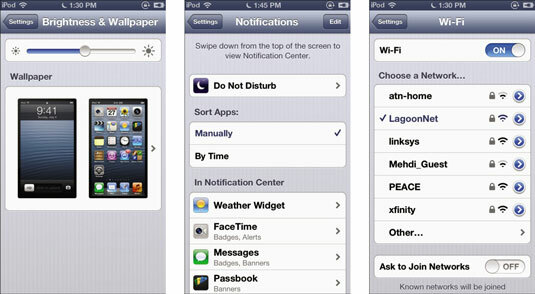 To turn Wi-Fi on, choose Settings→Wi-Fi from the Home screen to display the Wi-Fi Networks screen. Tap the Off button for the Wi-Fi setting to turn it on (tap it again to turn it off). When Wi-Fi is turned on, your iPod touch detects and automatically acquires a Wi-Fi signal you’ve used before, or it can detect one or more signals in the area and present them in a list for you to choose. The list of available Wi-Fi networks appears below the Wi-Fi setting. If your iPod touch isn’t already connected to Wi-Fi, it’s set by default to look for networks and ask whether you want to join them whenever you use something that requires the network (such as Safari, Mail, and so on). You can stop your iPod touch from looking and asking: Scroll down to the end of the list of Wi-Fi networks on the Wi-Fi Networks screen and then tap the On button for the Ask to Join Networks option to turn it off. You can still join networks manually, but you won’t be interrupted with requests to join them. You should turn off Wi-Fi if you’re not using it to save battery power and to keep your iPod touch from automatically receiving e-mail. (You can also change your Push settings to stop automatic e-mail.) Choose Settings→Wi-Fi, and then tap the On button for the Wi-Fi setting to turn it off. When connected to a Wi-Fi network, your iPod touch displays the Wi-Fi icon in the status bar at the top of the display. This also indicates the connection strength — the more arcs you see in the icon, the stronger the connection. If a Lock icon appears next to the Wi-Fi network name, it means that the network is locked and you need a password. When you select a locked network, the iPod touch displays an Enter Password screen and the onscreen keyboard. Tap out the password using the keyboard. Tap Join to join the network or tap Cancel in the upper-right corner to cancel joining. To join a Wi-Fi network that requires either a credit card or an account for you to log in to, select the network and use Safari to open the network’s web page. The first web page you see is typically the login page for the service (for example, a commercial Wi-Fi service or a hotel service). Your iPod touch remembers most Wi-Fi connections and their passwords and automatically uses one when it detects a network within range. If you’ve used multiple Wi-Fi networks in the same location, it picks the last one you used. You can also stop your iPod touch from automatically joining a Wi-Fi network — such as a paid or closed Wi-Fi service that somehow got hold of your device and won’t let you move on to other web pages without typing a password.